I have a confession to make. Finishing strong has never been my forte. 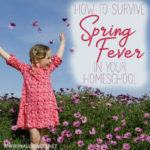 We hit the ground running at the beginning of our homeschool year, but something happens after Christmas and the new year and it all just fizzles out. I don’t know if its the extreme cold and long winters we often have, or I just get lazy with the cold, dreary days. This year has been particularly hard to keep up with a newborn that made a surprise appearance and spent time in the NICU after birth and my additional health issues. It has been a difficult year to say the least. But, that doesn’t give us an excuse not to work hard and finish strong. I have felt that conviction more and more over the past month. That is truly where this series came from – a necessity for myself. I knew if we were going to finish strong this year, we needed a plan. Not something I could write out and then forget. No, I needed actual steps and a way to make it happen. And I knew if I needed this encouragement, there had to be other homeschool moms that did too. If I’ve learned anything in my almost fourteen years as a mother, its that I’m never alone. I’m never the only one going through a trial, no matter how much it feels like it. I hope this past month has encouraged you all to keep pressing on and Finish Strong this homeschool year. Spring is my favorite season, which is probably one reason I find it harder to stay inside and homeschool. But we’ve given you some great tips, ideas and even lesson plans that can easily be done outside without compromising your school work! When I realized I needed a solid plan, I decided to write it out for you all too! 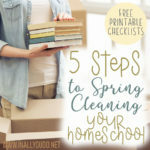 These are the 10 steps I’m taking to ensure we finish our homeschool year strong. We are pushing forward and pressing on to the finish line. I hope you’ll join us! If there is one thing I have learned over the years, its that our lessons need to be organized or we don’t get them done. If our curriculum and assignments aren’t organized, its a chaotic mess that leaves me exhausted and the kids frustrated. So take a moment to organize your lessons for the remainder of the school year. 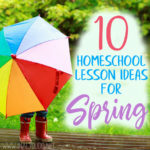 I know I just said organize and schedule out your remaining lessons, but that doesn’t mean to throw out the flexibility that comes with homeschooling. We have a lot of spring birthdays in our house, which means doctors appointments galore. I try to schedule as much as possible on one day, so there’s minimal interruption. Spring is a great time to be outside learning and enjoying nature, so be flexible in your learning! This is probably the best advice I can give. When I have an end date for something, it is like a due date for a client in my mind. That means the date is final and things need to be completed by then. Of course, if something major comes up, we’re flexible, but we really try and stick to that ending date. I always hated finals week at school. Oh I know tests are necessary at times, but to cram them all in one week was so overwhelming for me. Especially since I had serious test anxiety and typically did very poorly, even though I made straight A’s throughout the semester/year. I never want my kids to feel that pressure or anxiety, so we spread out our tests. Some of it works out naturally as curriculum ends at different times. Others I have to purposely move around so they are not overlapping. Whether you have a good test taker or a worrier, try spreading them out a little more this year and see if that improves not only their scores, but their attitudes! This is probably my biggest struggle. As homeschoolers we’re always looking for a great deal on curriculum, which often means buying before the school year is even over. And if you’re like me, its hard not to get too excited about the bright, shiny, new curriculum showing up on your doorstep. However, I urge you to just check it for accuracy and flaws (in case you need to return it) and then leave it boxed up until you finish the current year. I know that’s like leaving a Christmas present wrapped until New Year’s, but trust me…it will help keep you more focused on finishing strong. If your kids are like mine, they want to be outside in the sunshine all day. They loose track of time and would even forget to come eat lunch, if I let them. So why not take advantage of all the energy and plan some projects that can double as school work. 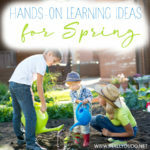 You could do some fun spring themed crafts or create a bucket list with some educational trips included. Preschoolers will love doing some spring activities or hands-on learning too. Plant a garden and work through a unit study at the same ensures ongoing learning. Many homeschoolers have the flexibility to travel and take trips when they want since we don’t adhere to a set schedule. But taking a trip doesn’t mean you can’t involve learning too! There are so many opportunities for learning while you’re traveling. Whether you’re taking a family vacation or you have a day of running errands and appointments, there are some easy ways and great benefits to homeschooling on the go. My kids love any excuse for having a party or fun day. They have even tried to make up their own holidays in hopes I’ll cave and give them the day off. So use that excitement in your favor! Plan a party they have to “earn” by completing all their school work for the year. We have done this in the past and I found my kids cheering each other on to finish and even helping each other when they are struggling with an assignment. It is so fun to watch them and see them push each other to not only finish, but do their best. I know many homeschoolers that take the summer months off from schoolwork. And while we have done this in the past, I’ve found it is much harder for us to start back up and get in a routine when we’ve been out of it for two months. This year we are going to do school 2-3 times a week just to keep some sort of a schedule. We will take this time to fill in the blanks on subjects that need more attention and maybe even sneak ahead a little in the subjects that come easier. We will probably do a reading challenge for my readers with prizes! And the final tip I have is probably the one that will help you the most for the upcoming year – give a good evaluation. I have made the mistake in the past not to evaluate our curriculum and we paid a terrible price. My kids were frustrated and literally shut down. As in they quit learning. Last year I did a thorough evaluation of our curriculum and how it worked for each child, not just overall. It was such a life-changing difference. I found some of our curriculum worked really well for one child, but another was falling behind in the process. That change has made a major difference in the success of our slow reader this year! Be sure you evaluate every thing. Evaluate your curriculum (per child, as well as a whole), the activities you did (both in the class and out), field trips and each child’s progress. Finishing strong doesn’t happen easily. That’s why I’m so excited about my brand new Finishing Strong Homeschool Mom Planner! 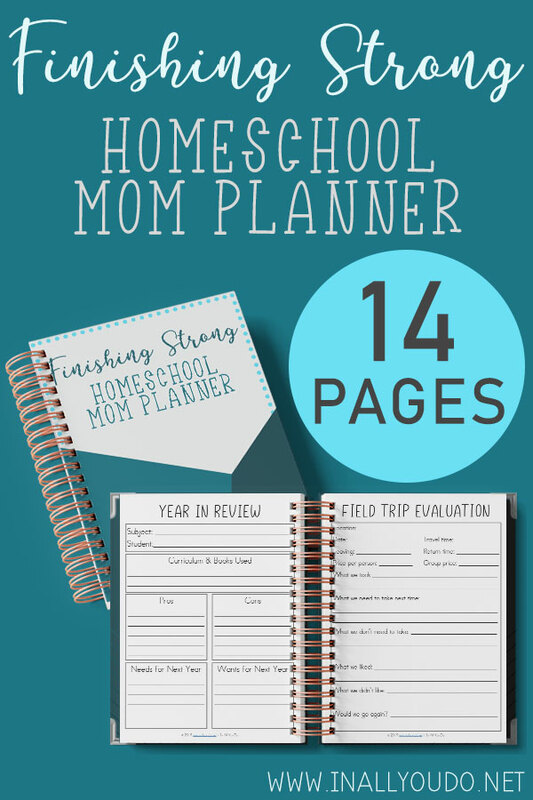 This planner has everything you need to finish strong this homeschool year! Curriculum Choices – use these for both current and new choices. Subjects to Study – this is a great sheet to use when putting together a plan for the next school year. Assignment List – we use this sheet to give a chronological listing of assignments so nothing gets lost. Blank Month Calendar – pretty self-explanatory, but this calendar is great for seeing the entire month at a glance. Notes Page – again…self-explanatory. Use this page to write notes about your curriculum, ideas for field trips, patterns you see in behavior, or whatever you need to write down! Daily Schedules – there are several different options to choose from in this section – weekly, daily and hourly. Year in Review page – if you need a more guided review page, this is it! Record everything you need for each student and their specific curriculum. Field Trip Evaluation – just what it says, this is a sheet to evaluate your field trips. This is handy when it comes time to plan for the new year. Especially if you’re like me and forget what you liked or didn’t like and if there was something you would do different next time. This is Me page – this is a fun end-of-the-year tradition that can be a treasured gift at graduation. Have each of your kids fill out this sheet at the end of the school year to keep a record of their favorites throughout the years. 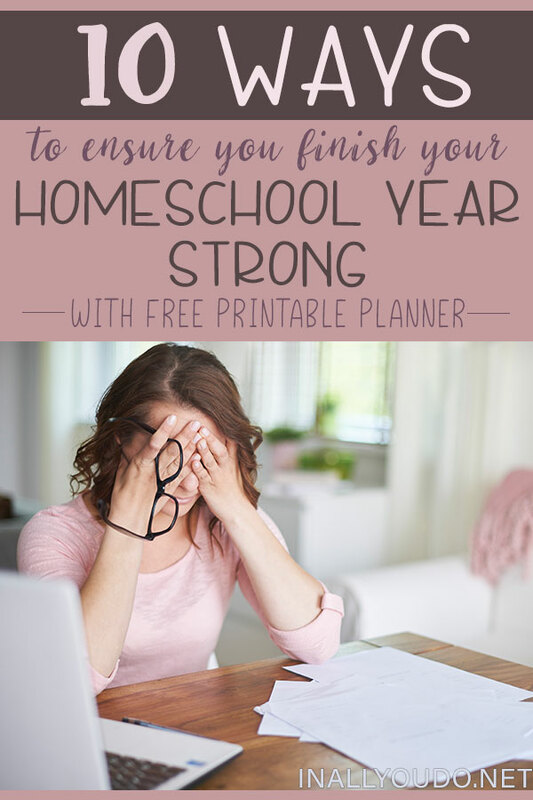 Download the Finishing Strong Homeschool Mom Planner! Are you ready to finish the year strong? I have included all 10 tips and 14 other printable pages to help you make the most of the end of the year and finish strong. Download the planner and print it off to get started today! I would love to know if you have any plans or traditions to help you finish your homeschool year strong!